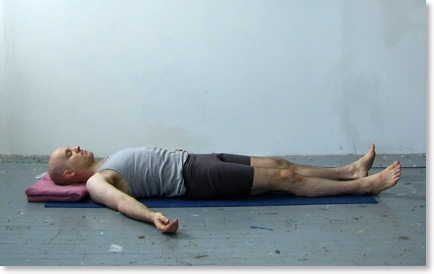 Shavasana (sometimes written as Savasana) is perhaps the most important part of a yoga practice. It serves many purposes: physical, spiritual and philosophical. • a decrease in heart rate and the rate of respiration. • a decrease in blood pressure. • a decrease in muscle tension. • a decrease in metabolic rate and the consumption of oxygen. • a reduction in general anxiety. • a reduction in the number and frequency of panic attacks. • an increase in energy levels and in general productivity. • an improvement in concentration and in memory. • an increase in focus. • a decrease in fatigue, coupled with deeper and sounder sleep. The yoga practice is a form of ritual. Regardless of the style of yoga, most classes follow the same pattern(2). It begins with a short opening period where the practitioner gathers him or herself up, turning inwards, away from the mundane world and setting an intention for the practice. Following that comes the practice itself. And to end there comes an integration phase where the effects of the practice are allowed to take hold and penetrate deep into the self of the practitioner. Shavasana is the primary vehicle of that process. 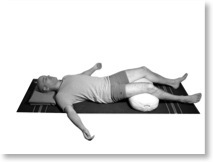 In the classic pose the practitioner lies out flat on the ground, with no support. For very few of us is this a truly comfortable position, however. Comfort is essential in the pose. Much as in the fairy tale of the princess and the pea, the slightest point of discomfort can be endlessly distracting. Here are several variations worth experimenting with for their varied effects. If the shoulders, back or chest are tight, the shoulders will not rest on the floor and the head will be pitched back. Elevating the head will bring the head and neck to a level position and will soften the back of the neck. This is worth doing even when the body is relatively open. Use either a standard fold blanket or a broad half-fold blanket under the head drawn down to graze the tops of the shoulders. Lengthens and softens back of neck. Softens jaw and muscles of face. Softens brain, allowing mind to settle. If the hamstrings or lower back are tight, it can be helpful to elevate the legs. This variation also good when there is discomfort in the hips or lower back. Place a bolster crosswise under the knees. If a bolster is not available, stack up two or three long half-fold blankets and use them instead. Allows thighs and hamstrings to soften. Takes weight off pelvis, allowing it to rest level. 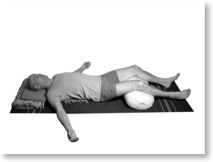 Allows lumbar spine to settle and lower back to release. A more elaborate variation of a bolster under the knees. This is, in fact, a slight inversion, with the legs and pelvis elevated. Because of this, it is not suitable for women who are actively menstruating. Place a broad half-fold blanket at the base of a chair, sofa or bed and have another blanket for under the head. 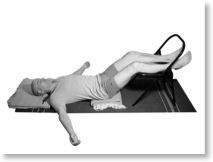 Lie back with the calves on the chair, the pelvis and head on blankets, the shoulders on the floor. Takes pressure of the heart. Allows venous blood and lymph to drain out of the legs. Another variation to consider when the upper back, shoulders and chest are tight. Elevating the trunk opens the chest and allows the shoulders to release back and down. This makes it a useful counter to forward extensions, Halasana (Plough Pose) and Sarvangasana (Shoulder Stand). It also frees up the breathing mechanism, making this an ideal set-up for reclined pranayama. This variation can also be done with a bolster under the trunk for a much higher lift. Arrange two long half-fold blankets in the shape of a "t” to go under the trunk and place a broad half-fold blanket on top for under the head. Sit at the base of the blanket set-up and lie back with the blankets into the small of the back to support the lumbar spine. Draw the pillow-blanket down to graze the tops of the shoulders and to support the base of the neck. Allows shoulders, neck and chest to soften. Allows shoulders to fall back and down, reduces excessive curvature of thoracic spine, allowing cervical spine to lengthen and neck to release. Lifts and opens ribcage, maximizing interior space of lung cavity. 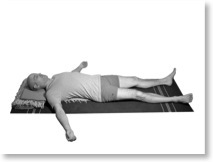 This variation is excellent for when you are planning a long Shavasana. The body is fully supported in such a way that the contours of the spine are balanced and most of the joints are set in an optimum position for maximum release. Arrange two long half-fold blankets in the shape of a “t” to go under the trunk and place a broad half-fold blanket on top for under the head. Place a blanket cross wise for under the knees. Sit at the base of the blanket set-up and lie back with the blankets into the small of the back to support the lumbar spine. Draw the pillow-blanket down to graze the tops of the shoulders and to support the base of the neck. Adjust the position of the bolster under the knees so that the heels can rest comfortably on the floor and the thighs and hips can settle. Allows shoulders to fall back and down, reducing excessive curvature of thoracic spine, allowing cervical spine to lengthen and neck to release. It is not sufficient to simply plop oneself down in corpse pose. The alignment and positioning of the pose is as important as for any active asana. The body must be organized in such a way as to affect the nervous system and mind at deeper and deeper levels. It becomes important, then, to create a sense of balance and symmetry in the gross body, so that the subtle neurological energies can flow unhindered. The following sequence is presented for the classic pose, but can be modified to fit any of the above variations. 1. Sit on your mat with the feet flat on the floor and hold on to the knees. Take a moment to make sure you are squared off with the mat and with the room. This will be important when you lie down, as you will be taking subconscious cues from the space around you as to your position. 2. Keeping the core muscles soft and, using only the strength of the arms, roll your spine down towards the floor. Take care to place each segment of the back evenly down on the floor before proceeding to the next. 3. Lie back with your head on the blanket and draw it down to graze the tops of your shoulders and support the back of the neck. Take a moment in this position to assess your alignment. Is the pelvis level and the lower back long? If not, place the hands on the buttocks and both lengthen and broaden them as you roll the flesh towards the heels. 4. Slide out one heel at a time to extend the legs. Begin with the legs together and then let them drop out to the sides. Take the feet a comfortable distance apart, but be sure not to overdo it. Wider is not necessarily better. 5. Pick the head up and glance down the length of the body. If the legs are not arranged symmetrically, adjust them so that they are. 6. Press the elbows firmly down into the floor and pick the upper back up off the blanket. Tuck the shoulder blades in and roll the shoulders down, opening the top chest. 7. Keep the elbows where they are and release the forearms down with the palms facing up. 8. Mentally scan the body and see if any other minor adjustments are necessary. After adjusting the shoulders, you may find it necessary to re-adjust the lower back. This may, in turn, shift the shoulders a little. Sometimes it is necessary to go back and forth a few times to get it right. DO NOT GET CARRIED AWAY WITH YOUR ADJUSTMENTS. It is possible to go on forever adjusting around attempting to achieve the perfect position. Deal with the major issues and then make a firm resolution not to change anything else for the remainder of the time. 9. Glance up and adjust the forehead so that it is level with the ceiling. The back of the head is an unreliable reference point as it is unlikely to be completely symmetrical. 10. Gently allow the chin to release into the chest and the back of the neck to lengthen. You want there to be a gentle downward incline from the eyebrows to the top of the chest. 11. Release the eyelids from top to bottom and begin the process of turning your awareness inwards. Hold the pose for anything from 3 to 30 minutes. There are many different ways to practice interiorization in Shavasana. Here are four approaches, each of which deals with successively more subtle points of focus: the body, the senses, the breath and the mind itself. Any one of these practiced alone would be sufficient, or you may combine two or more for longer holdings. Starting with the feet and working your way to the head, use suggestion to soften and release the different parts of the body. • Silently name each body part and imagine the breath flowing directly into that body part. Think of the body part as being darker or in shadow and imagine that the breath brings light into the muscles. • Alternatively, you can think of the breath as dissolving the tension like sugar dissolving in water. With each exhalation the tension flows out of the body. • After naming the body part, imagine it getting heavier and heavier with each exhalation and sinking into the floor. • After naming the body part, imagine it melting as if it were snow melting in the winter sun. • Imagine the body were a sack of grain. For each body part, visualize rips forming in the sack and the grain pouring out onto the floor. • Imagine the body as a suit of clothes falling through the air in slow motion and touching the ground, body part by body part. As each part touches the floor, all the wrinkles fall out of the fabric. Sensory withdrawal begins with relaxation of the physical sense organs. This softens their attachment to the outside world, preparing them to turn inwards. Sometimes this can be a bit nebulous for the inexperienced practitioner to grasps. Releasing specific parts of the face can assist in the release of the nearby sense organs. The sense of touch resides in the skin. While softening the muscles of the body, pay special attention to the skin, allowing it to soften and release as well. This has the added benefit of calming the nervous system directly, as there is a connection between the skin cells and the nerves: nerves, skin and brain all emerge from the same embryonic cells in the womb. • Soften the tip of the tongue and allow it to detach itself from the roof of the mouth. • Release the tongue from the tip to the root, near the back of the throat. • Release the roof of the mouth and the back of the throat. • Soften upwards from there behind the nose and into the nostrils. • Soften the bridge of the nose and the sinuses. • Soften the chin and the jaw. • Soften the hinges of the jaw. • Soften the ear canal in and forward towards the eyes. • Soften the inner ear. • Soften the temples. Allow them to deflate and sink inwards. • Soften the eyebrows, the cheek bones and the bridge of the nose. • Soften the muscles around the eyes. • Soften the eyeballs and allow them to sink down past the temples. • Soften the backs of the eyes and the optic nerve. moving back into the skull. • Soften the brain itself. • Allow the brain to detach itself from behind the forehead and let it sink down to rest on the back of the skull. • Allow the front of the brain to settle on the back of the brain. • Soften the individual brain cells and allow them to deflate and sink towards the floor. With the body relaxed and the senses turned inwards, it is now possible to become aware of the inner spaces of the body and the movement of the breath. There are two ways to think of the breath, either as the mechanism of breathing or as the flow of breath. • Bring the awareness into the inhalations and exhalations. • Observe what moves as you inhale, what moves as you exhale. • Observe the expansion of the ribcage as you inhale. • Observe the release of the belly as you exhale. • Observe the spreading of the diaphragm as you inhale. • Observe the release and resetting of the diaphragm as you exhale. • Allow each inhalation to emerge seamlessly out of the exhalation that precedes it. • Allow each cycle of breath to flow seamlessly into the cycle that follows it. • Observe each individual thought as it arises. • Do not categorize the thoughts. Simple acknowledge them for what they are. Think of them as words or images projected on a screen. • As the mind wanders, gently acknowledge that it has done so and bring your awareness back to the thoughts flowing across the mind. • As the mind becomes engaged in the thoughts, gently acknowledge that this has happened, release the thought and allow it to proceed on its way. • As the mind begins to calm itself, you may find that the thoughts become a little less frequent a little less insistent. Start to become aware of the moments of silence between each thought. Shavasana is a very demanding pose to practice. It has the potential to take us right up to the very limits of conscious awareness. It is as easy to think it unnecessary and to avoid it as it is to allow it to become nothing more than a nap. It demands of us both diligence and finesse. Too long in the pose and the mind may become dull and even lose consciousness. Too little time, or time spent wrestling with our thoughts, and the pose is almost useless. And yet, the benefits are many and profound. I urge you to give the pose the attention it deserves. Experiment with the different set-ups and become familiar with their effects. You will find different variations appropriate for different practices, different times and different states of mind. Experiment, too, with the different methods of turning inward to find what works for you so that you may reap the benefits of this wonderful pose. 1. Bourne, E. J.,(1995) "‘The Anxiety and Phobia Workbook - A step by step program for curing yourself of extreme anxiety, panic attacks and phobias"’, MJF Books, New York. 2. De Michelis, E. (2005) "A History of Modern Yoga: Patañjali and Western Esotericism,"” Continuum Books, London.